First came the arrest of a suspect in the decades-old Golden State Killer case. Could DNA crack the Zodiac Killer case next? 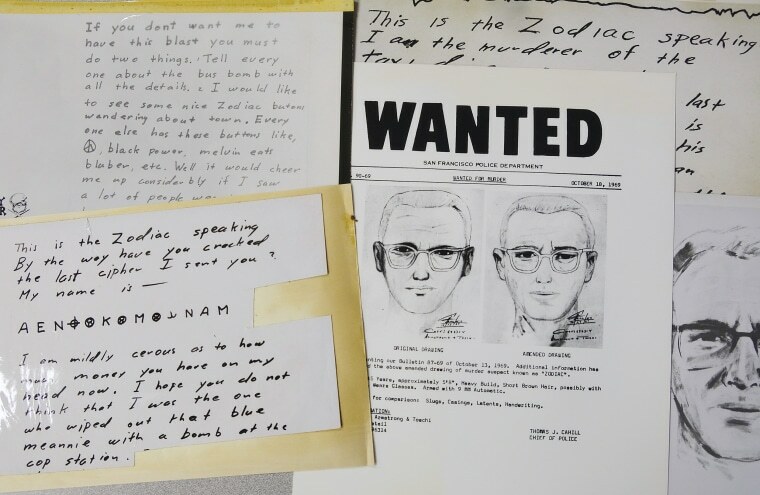 LOS ANGELES — Following last month's DNA-driven arrest of a suspect in California's four-decades-old Golden State Killer investigation, detectives on the trail of the infamous Zodiac Killer say they believe genetic evidence could provide a breakthrough. A suspect calling himself the Zodiac Killer is believed to be responsible for at least five killings in Northern California in 1968 and 1969. The suspected murderer mailed taunting letters and cryptograms to two San Francisco newspapers in 1969. Now the question for pursuers, experts say, is whether or not saliva-derived DNA that might be on stamps and flaps from envelopes can still provide usable scientific markers. "It’s definitely possible," said forensic scientist Ruth E. Ballard of California State University, Sacramento. "If they didn’t steam the stamp off and it was stored in a cool dry place, maybe there’s sufficient DNA left." The April 25 arrest of 72-year-old Joseph James DeAngelo in the Golden State Killer case has renewed interest in the state's Zodiac serial killer saga, which was the subject of a 2007 movie "Zodiac." But detectives say the timing is pure coincidence. In a bid similar to the one undertaken by Golden State Killer investigators, police in Vallejo, California, sent two letters connected to the suspect to a private lab months ago, Detective Terry Poyser said. He added that the results of the newest DNA testing were expected soon and that detectives hope to submit them to a familial DNA service. Investigators in the Golden State Killer case uploaded DNA to an open-source genealogical website, where they claim to have found a partial match to DeAngelo's distant relative. Police who collared the former police officer said they had to produce a family tree dating back several generations before they zeroed in on DeAngelo, suspected in at least 12 murders and 50 rapes between 1976 and 1986. Ballard is optimistic about the odds of catching the Zodiac Killer. She said the science of extracting DNA from everyday items continues to accelerate. "Our power of discrimination has gone through the roof," she said. Gary Harmor, director of a private lab known as the Serological Research Institute, said he's concerned the letters are too old to produce usable markers. "I have worked with DNA from the 1960s and '70s at my lab," he said. "It’s hard to get enough that hasn’t degraded to get a profile from it." Experts say another question is whether or not the evidence in the Zodiac file was stored in a cool, dry place or in a freezer. Because advances in DNA technology didn't start to change investigative protocols until the 1980s, the samples kept by Zodiac detectives would have had time to degenerate and take on bacteria. "Back in those days nobody knew you could get DNA from the back of stamps," Ballard says. "Bacteria loves things that are moist," agrees John Taddie, director of DNA testing lab LB Genetics in Santa Ana, California. "That could jeopardize the samples." Harmor said detectives chasing the elusive Zodiac Killer will still need a lot of luck. First of all, the DNA has to be good enough to use. Then the databases used by investigators — they'll likely check the FBI's Combined DNA Index System (CODIS) before using open-source family tree sites — will likely need a lot of samples for comparison. Most importantly, any database would need to include a relative of the suspect to produce a match. "It’s a bit of a long shot," Harmor says, "but it's certainly worth a try."